Societies characterised by a high transmission of socioeconomic status across generations are not only more likely to be perceived as ‘unfair’, they may also be less efficient as they waste the skills of those coming from disadvantaged backgrounds. Existing evidence suggests that the related earnings advantages disappear after several generations. This column challenges this view by comparing tax records for family dynasties (identified by surname) in Florence, Italy in 1427 and 2011. The top earners among the current taxpayers were found to have already been at the top of the socioeconomic ladder six centuries ago. This persistence is identified despite the huge political, demographic, and economic upheavals that occurred between the two dates. Intergenerational mobility is concerned with the relationship between the socioeconomic status of parents and that of their children as adults. Societies characterised by a high transmission of socioeconomic status across generations are not only more likely to be perceived as ‘unfair’, they may also be less efficient as they waste the talents and skills of those coming from disadvantaged backgrounds. Mobility is commonly measured by intergenerational elasticity, which is the correlation between paternal status and a son’s adult status. The higher the elasticity, the lower the mobility. For example, in the case of earnings, current elasticity estimates broadly range from under 0.2 in the Scandinavian countries to almost 0.5 in Italy, UK, and the US (Corak 2013). Most scholars who have empirically studied intergenerational mobility have focused on the correlation in socioeconomic status between two successive generations – parents and their children – and have shared a common view that the economic advantages and disadvantages of ancestors vanish in a few generations. For example, Becker and Tomes (1986) argue that “almost all the earnings advantages or disadvantages of ancestors are wiped out in three generations”. In a recent paper we challenge this view (Barone and Mocetti 2016). We focus on the Italian city of Florence, for which data on taxpayers in 1427 – including surnames, occupations, earnings, and wealth – have been digitalised and made available online. We matched these data with those taken from the tax records relating to the city of Florence in 2011. Family dynasties are identified by surnames. Table 1 offers a first flavour of our results. We report for the top five and bottom five earners among current taxpayers (at the surname level) the modal value of the occupation and the percentiles in the earnings and wealth distribution in the 15th century (the surnames are replaced by capital letters for confidentiality). The top earners among the current taxpayers were already at the top of the socioeconomic ladder six centuries ago – they were lawyers or members of the wool, silk, and shoemaker guilds; their earnings and wealth were always above the median. In contrast, the poorest surnames had less prestigious occupations, and their earnings and wealth were below the median in most cases. More rigorous empirical analysis confirms this evidence. When regressing the pseudo-descendant’s earnings on pseudo-ancestor’s earnings, the results are surprising: the long-run earnings elasticity is positive, statistically significant, and equals about 0.04. Stated differently, being the descendants of the Bernardi family (at the 90th percentile of earnings distribution in 1427) instead of the Grasso family (10th percentile of the same distribution) would entail a 5% increase in earnings among current taxpayers (after adjusting for age and gender). Intergenerational real wealth elasticity is significant too and the magnitude of its implied effect is even larger: the 10th-90th exercise entails more than a 10% difference today. Looking for non-linearities, we find, in particular, some evidence of the existence of a glass floor that protects the descendants of the upper class from falling down the economic ladder. These results are new and remarkable and suggest that socioeconomic persistence is significant over six centuries. These results are even more surprising if we consider the huge political, demographic, and economic upheavals that have occurred over a so long a time span (see Figure 1), and that were not able to untie the Gordian knot of socioeconomic inheritance. Note: Florence passed from being the capital city of a small city-state (figure a) to a city within a larger State (with the Italian unification in 1861), whose capital city is located elsewhere. Regarding demography and GDP per capita, they were fairly stable between 1400 and 1800 and experienced a huge increase in the 19th and 20th Centuries (figures b and c); figures for population and GDP per capita are authors’ elaborations on data drawn from http://www.paolomalanima.it/. One might wonder whether these results can be generalised to other societies. Florence does not seem a polar case in terms of economic development and (static and dynamic) inequality. Hence, we argue that our results can be thoughtfully extended to other advanced countries of the Western Europe. We also find two further interesting pieces of evidence. 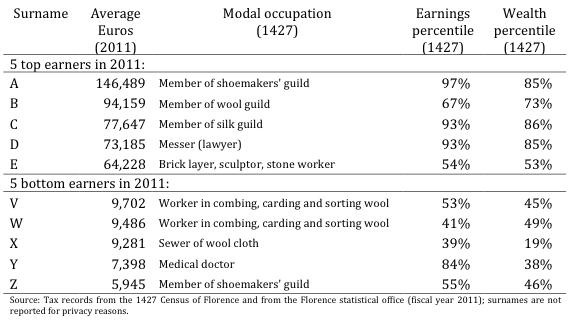 First, we show that intergenerational mobility in the 15th century was much lower than at present – the intergenerational earnings elasticity between two successive generations was estimated to be between 0.8 and 0.9, thus depicting a quasi-immobile society in 1427. It is plausible, though we do not have direct evidence for this, that earning elasticity was close to 1 until the 20th century (before the Italian industrial revolution and mass schooling) and lower in the subsequent period. This may explain why we still find some degree of inheritance of socioeconomic status after six centuries. Second, we find evidence of dynasties in certain (elite) professions – the probability of belonging to such professions (lawyers, bankers, medical doctor or pharmacist, goldsmiths) today is higher the more intensely the pseudo-ancestors were employed in the same professions. This latter result is consistent with our baseline evidence on the long-run persistence of socioeconomic status, particularly at the top of the economic ladder. Moreover, it also highlights a potential channel of inheritance, related to the market and non-market mechanisms governing access to certain professions. Barone, G and Mocetti, S (2016) “Intergenerational mobility in the very long run: Florence 1427-2011”, Bank of Italy working papers, 1060. Becker, G S and N Tomes (1986) “Human capital and the rise and the fall of families”, Journal of Labor Economics, 4: 1-39. Corak, M (2013) “Income inequality, equality of opportunity, and intergenerational mobility”, Journal of Economic Perspectives, 27: 79-102.